Ensuring the sustainability of Earth’s natural and social systems is among the most important challenges of our time. An innovative first-year course at Laurier is helping students prepare to address that challenge. Perspectives on Sustainability sees students learn about and reflect on the challenge of sustainability from philosophical, social, economic and cultural perspectives, as well as the complex ways natural and social systems interact. Through lectures about the sustainability of food systems, cities, culture and other areas, students learn why a focus on sustainability is key to a healthy and prosperous future. "The idea is that students learn about these different aspects of sustainability at a level that they can actually apply in whatever discipline they're in or whatever job they're going to take – it's an introduction for anybody," says Associate Professor Manuel Riemer. "You don't need to be in a sustainability field like environmental studies. The majority of students in the course are, in fact, business and economics students." As a course, the interdisciplinary Perspectives on Sustainability is a model of academic co-operation. During the four years it has been offered at Laurier, the course has travelled between faculties, for the past two years offered under the Faculty of Arts and now the Faculty of Science. "We've grown the number of students every year," says Riemer. "When I taught the course the first year, we had 70 or so students. It has been growing ever since. This year, the course is capped at 150 students and it is at near-capacity." Perspectives on Sustainability helps students understand how communities, governments, organizations, social movements, private corporations and individuals can contribute to meeting sustainability challenges. After foundational lectures by the course instructor, two guest lecturers present about a different theme relating to the topic of sustainability each week. On the first day, university-based lecturers provide an overview of the topic. On the second day, practice-based guest lecturers complement core learning, introducing ways institutions and organizations are working toward a more sustainable future. "This is a university-community collaboration," says Riemer. "There are a lot of people from the community who volunteer their time to take part in the course and they do so because they value the education of young people and are committed to the cause. This course wouldn't work without that." 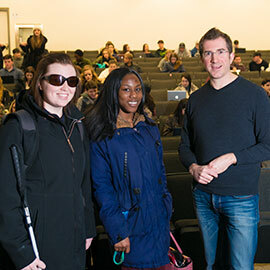 Allan Taylor, program development manager at Sustainable Waterloo Region, was a recent guest lecturer as part of Perspectives on Sustainability, discussing a net-positive energy building project his organization is undertaking. Net-positive energy buildings produce more energy than they consume. Taylor says seeing so much student interest in Perspectives on Sustainability is exciting, adding that the course offers a "fantastic foundation" for anyone hoping to work in the field of sustainability. "The fact that this class is open to anyone in any discipline is important," says Taylor. "At Sustainable Waterloo Region, we're always looking for champions. The fact that the program is creating champions in a variety of disciplines is a huge step in the right direction." Sustainable Waterloo Region, a social enterprise that helps organizations convert their sustainability interest into action, evolved out of the work of former Laurier business students Chris DePaul and Mike Morrice under the guidance of Associate Professor Barry Colbert, who is also one of the guest lecturers for the course. Students enrolled in Perspectives on Sustainability also have the chance to participate in a sustainability challenge, working in teams to propose solutions to a sustainability problem. Each year, the resulting projects are shared with the campus community during a public event in Laurier's Science Building atrium. This year, the event will be held on March 29 at 8:30 a.m.
Finding sustainability solutions for the future is key, says first-year student Laura Caruana. "This course shows the potential for changing the way we act when it comes to the environment," she says. Claire Bennett, manager of Laurier's Sustainability Office, says Perspectives on Sustainability offers benefits to students, the university and the natural environment. Laurier works hard to ensure the sustainability of its operations, Bennett says, with a carbon reduction program, energy reduction initiatives, waste management program, bike share program, solar wall installation, community gardens and other initiatives that place sustainability front and centre at the university. For its efforts, Laurier in 2016 was named among Princeton Review's top green colleges in North America, one of just nine Canadian universities on the list. Laurier was also presented Sustainable Waterloo Region's 2016 Environmental Awareness Award and TravelWise Leadership and Innovation Award. In 2015, the university was presented the Chamber of Commerce Greater Kitchener-Waterloo's Environment and Sustainability Award. "With these awards, we are becoming a leading operation in terms of sustainability," says Bennett. "Sustainability is one of those things that fits within everything the university does. It's all-encompassing." Bennett has also been recognized for her efforts. She was recently named a Canada's Clean 50 award winner for 2017 in the emerging leader category. Canada’s Clean 50 provides annual recognition to leaders in sustainability for their contributions during the prior two years. Along with other sustainability projects, Bennett is currently undertaking an update of Laurier's sustainability action plan, as well as overseeing the university's strategic energy management project, called LEEP. Members of the Laurier community can contact Bennett to provide input or learn more. While worrying headlines about environmental issues such as climate change, species extinction and pollution are certainly not uncommon, Perspectives on Sustainability keeps a positive focus on what can be done to help reverse destructive environmental trends, coupled with reinforcing the urgency to act. "Sustainability is not really a choice, it's something that we need to do and everybody has a role to play," says Riemer. "I want students to see that there are a lot of things we can do. There are a lot of creative, innovative solutions that are currently being worked on. "I want them to be alert to the issues, but in the end I want them to leave with hope and excitement that they can actually do something about it."